Library image #359: A creek within the Raven Cliffs Wilderness. The United States Congress designated the Raven Cliffs Wilderness (map) in 1986 and it now has a total of 9,240 acres. All of this wilderness is located in Georgia and is managed by the Forest Service. The Raven Cliffs Wilderness is bordered by the Mark Trail Wilderness to the north. 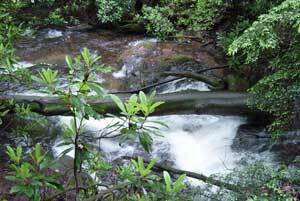 Numerous streams and waterfalls, high peaks, and rocky outcroppings combine to create a rugged mountain Wilderness divided between the Chestatee and Chattahoochee Wildlife Management Areas. Elevations range from about 1,800 feet on Boggs Creek to 3,846 feet on Levelland Mountain. A dense forest of hardwoods and scattered pines has recovered from substantial logging operations early in this century. Deer, squirrels, ruffed grouse, black bears, turkeys, and raccoons can be found. Across U.S. 129 lies Blood Mountain Wilderness. This Wilderness receives relatively heavy visitor traffic. The Appalachian Trail follows the crest of the Blue Ridge through this area for 6.6 miles; there's a shelter at Whitley Gap. Another trail, the Raven Cliffs Falls Trail, leads upstream 2.5 miles to a popular waterfall. Planning to Visit the Raven Cliffs Wilderness? How to follow the seven standard Leave No Trace principles differs in different parts of the country (desert vs. Rocky Mountains). Click on any of the principles listed below to learn more about how they apply in the Raven Cliffs Wilderness.